In terms of introductions, it’s hardly riveting stuff. It is, however, cheese at its cheesey best. Plonking you straight into the role of Thomas, the eponymous hero of the piece, you start off on the first floor of a pagoda, and must work your way up the narrow ledges to rescue Silvia. 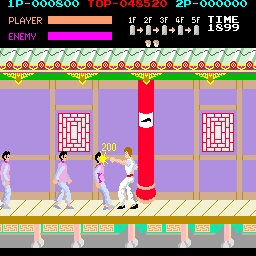 The idea could well have been based on a concept Bruce Lee wanted to work in his movies, that his mission would take place in a pagoda over a series of levels, working his way up to the big boss at the top. So, what is there to stop you reaching the top? Bloody all sorts. The most easily overcome obstacle is the first wave of human attackers. They’ll run at you, from both sides, raising their fist, but all they’ll do is grab hold of you in a choke hold, steadily draining your energy bar. The obvious thing to do is smack them off the ledge whichever way you like. 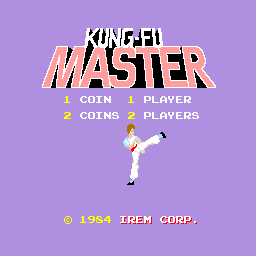 As a Kung-Fu “Master”, your moveset is a little limited; you can punch and kick (albeit very quickly), and you can perform these whilst standing, crouching or jumping with varying effectiveness. Whilst kicks have a longer reach, each blow only scores you half as many points as a punch, with the exception of the jumping kick. 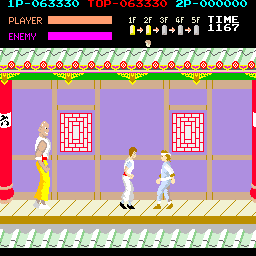 There is a slight variation in height with each move, which is pretty sophisticated stuff for the early eighties. Some of the baddies are a little bit more violent, and will fling knives at you, and being slightly tougher, will require two hits to knock them off. To finish off, you’ll face a twig-waving bad guy at the end who will take several hits to defeat. In fact, he even gets an energy bar! Defeat him, climb the stairs and take on the next level. As a ten-year old, this first level was hard enough to provide ample challenge, but now, at the age of 30, it seems a pushover. Probably the first thing that raised the challenge was that you went the WRONG WAY. Side-scrolling beat ‘em ups almost ALWAYS follow the rule that you scroll from left to right, but here you went the opposite way first, changing direction on each level. A subtle change, but a clever one. Anyway, as you progress you’ll face various other types of foe, including balls (or eggs, I’m not sure which) that release dragons or explode, baddies that are half the size of normal baddies (are they children? That would be a questionable decision to include them if they are! ), deadly butterflies (or something), and even more difficult bosses at the end of each level. Which clinches the fact, this is a score-attack game, so use your punches to maximise it! 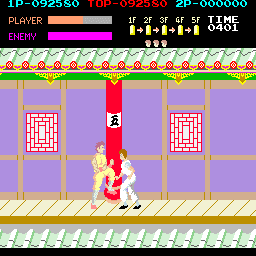 The graphics are clear, very 80s style, and very colourful. 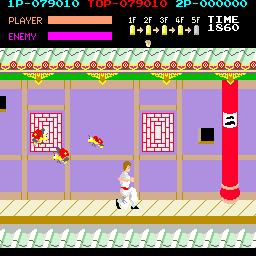 The difficulty curve is good (for a 30 year old), with sudden rises for the bosses (especially levels 4 and 5), and the sound effects are awesome (with Bruce Lee-type vocal noises for the flying kicks and solid crunches for the successfully landed blows). The music is a bit basic, but does the job. This is the 80s, after all. 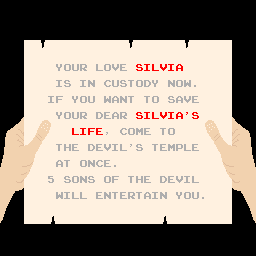 Probably the most iconic part of the game is the introduction, which depicts you holding the ransom letter while a short musical ditty prepares you for the game. The short, sharp introduction to games is a thing of the past as most games these days deliver a training mission to get you used to the controls. There’s not a lot of depth to the game, but who needs depth when you’ve got fun! There are bucketloads of it here, even over 20 years on. The difficulty level is fairly tough on newbies, and your first couple of attempts will probably end in miserable failure, but with practice you’ll soon be reaching the higher levels of the game, and even looping the game back to the beginning. 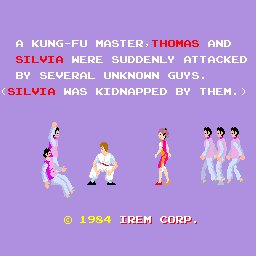 A valuable piece of history, especially as the first arcade side-scrolling beat-em ‘up.